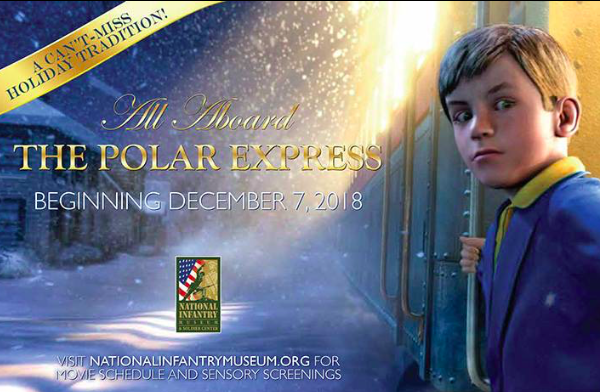 The Polar Express 3D is returning to the Giant Screen Theater inside the National Infantry Museum every weekend beginning December 7, 2018 with media sponsor MuscogeeMoms! Cuddle up in your favorite pajamas and enjoy this family friendly tradition that is sure to put you in the holiday spirit. The 2004 film is based on the children’s book of the same title by Chris Van Allsburg. This year, every child wearing pajamas will receive a free hot chocolate on the museum! The train’s conductor will make appearances at the screening to punch exclusive golden tickets prior to the film. Tickets are only available for purchase the day of each screening. Tickets may be purchased at the Giant Screen Theater’s box office. If you have any questions, please call the box office at 706-685-2622. Ask about special screenings for schools and homeschoolers! Contact the Education Department at 706-653-9234 or email [email protected] for more information.